Rumor has it that Colombia’s cuisine is not impressive at all. It is said to be bland, dull and lacking taste compared to other South American countries. What’s more, it’s mostly deep-fried and unhealthy. All these bad reviews did not put me off and I set out to prove them wrong. I was happy to find there is a strong vegetarian wave spreading around the country. In addition, the variety of world cuisines and restaurants you can choose from is huge. Colombia is the place to be in 2017 for many reasons. And coffee is only one of them! 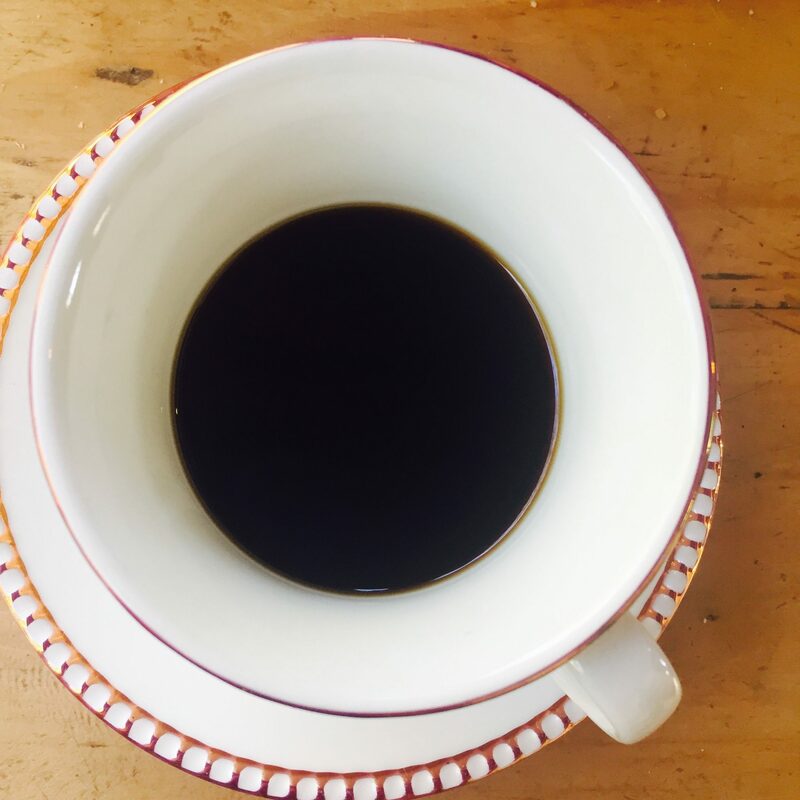 The country produces some of the world’s highest quality coffee, and is one of the few countries worldwide that grows only the preferred sort of Arabica. Unfortunately, all the premium coffee beans are sold to export companies. The good news is that coffee tourism is becoming more and more popular throughout the whole country. The focus now is on developing a signature coffee culture. Specialty coffee shops are opening up everywhere and you can easily enjoy the taste of a good cup of local coffee. 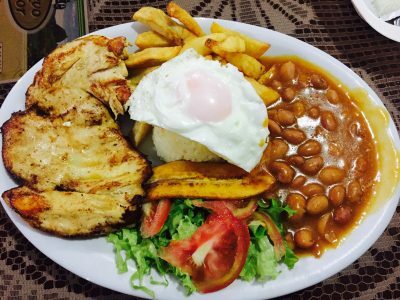 Typical Colombian food is high in protein and good fats – seafood, beans, lean meat, eggs, and avocado. Lunch turns into a filling, gut-busting challenge. Colombians take pride in everything. That’s why they use only premium local produce to prepare their traditional dishes – high-quality meat, fresh eggs and seafood from the Pacific or the Caribbean. You can even find vegetarian protein. Eating healthily and going vegetarian is the new trend spreading across the country. There are lots of vegetarian restaurants emerging and when it comes to produce, farmers are going organic. 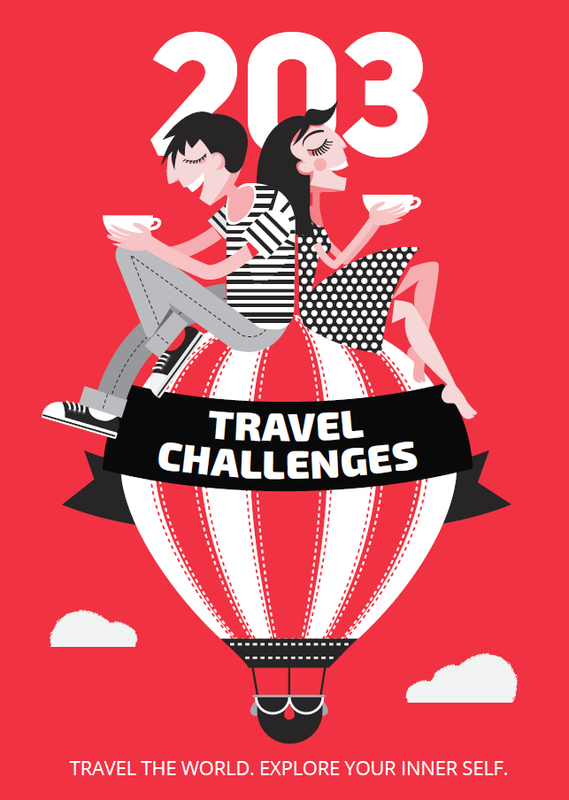 To fully experience a foreign country, you should try at least one local specialty. Tamal is a simple dish enjoyed all across Colombia. It comes wrapped in a banana leaf and the filling inside could vary between chicken, pork belly, ribs, boiled eggs, carrots, potatoes, rice and more. Mondongo is one of the hearty soups that will keep you warm on a cold day in the Andean zone. It is a signature dish of Colombia, containing pork, tripe and chorizo. The secret ingredients are cilantro and lime juice. 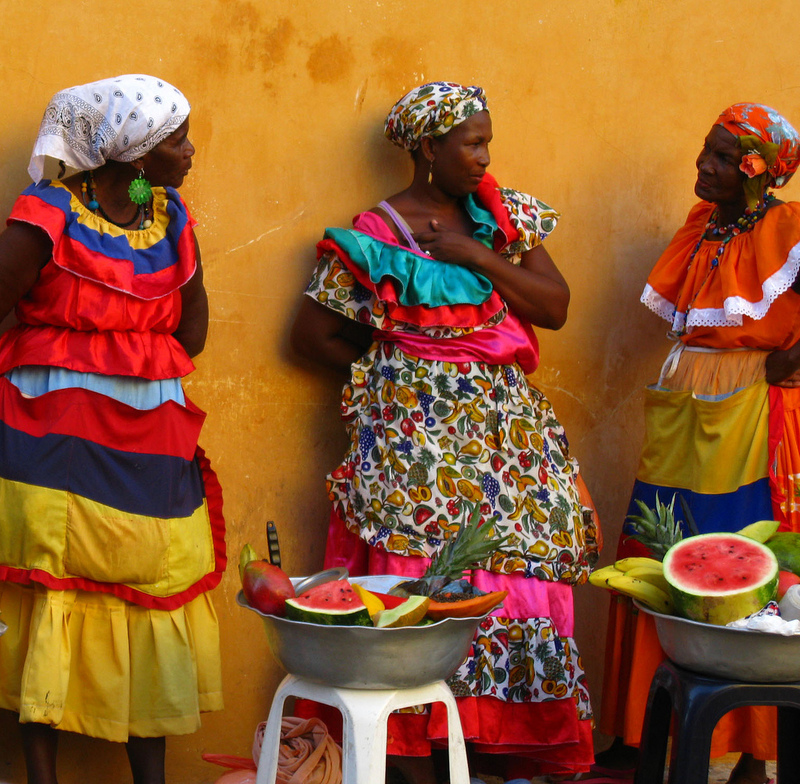 Colombia is all about the street food – from fresh fruit and juice stands to deep-fried snacks! The most famous are probably the sweet little donuts – boñuelos and the stuffed empanadas. Empanadas and arepas are sold at every corner. Stuffed with chicken, beef or mixed meat, cheese, and avocado – the choice is yours. If you are looking for something exotic, but less filling, go for patacones (deep-fried plantains). They’re known as Colombia’s to-go snack. Colombia offers diversity at its finest especially when it comes to fruit. There are loads of exotic fruit and you should eat all of them! On a hot Caribbean day make sure to fuel in on fresh fruit and freshly squeezed juices. Lime, orange, mandarin juice – they are everywhere. My personal favorite is guanabana. Mango and bananas are the most common when it comes to fruit. For an authentic taste, try pitaya, lulo, granadilla, mamoncillo or guanabana. You will not find them anywhere else. 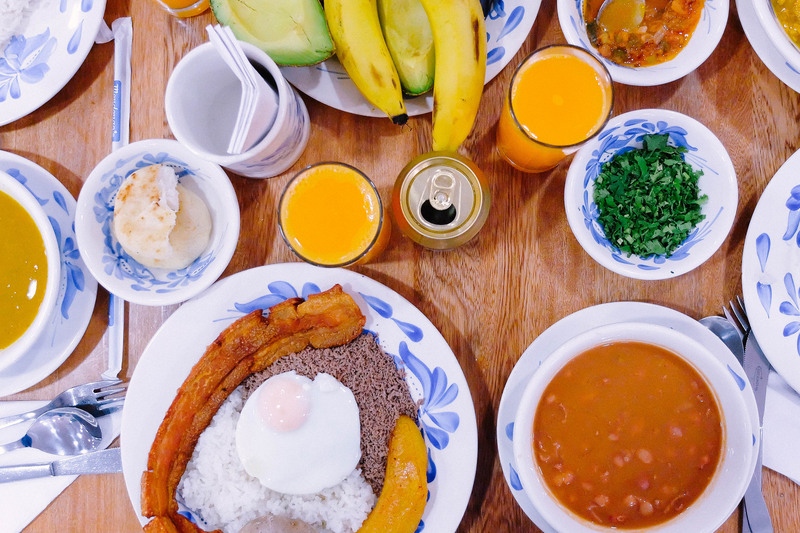 You can basically find ajiaco anywhere in the country, but it’s typical for the region of Bogota (as bandeja paisa is typical for Antioquia). This hearty soup consists of chicken, three varieties of potatoes and corn. It’s usually served along with cream, capers, avocado and plantain. Simple and delicious – a great way to warm up on a rainy day in the capital! Aguardiente is a strong alcoholic beverage found throughout Latin America and Spain. The name comes from Latin and it means fiery (ardiente) and water (agua). Just like brandy, aguardiente started out as a distilled spirit made of whatever ingredients were available locally. Colombia’s aguardiente has a strong anise flavor. The brand we tried is the country’s best Aguardiente Antioqueño. The costeños (people from the coast) have it all figured out – freshly caught fish and fresh coconut! Sounds like the ultimate beach meal, so why not combine them and make onе of Colombia’s best dishes? 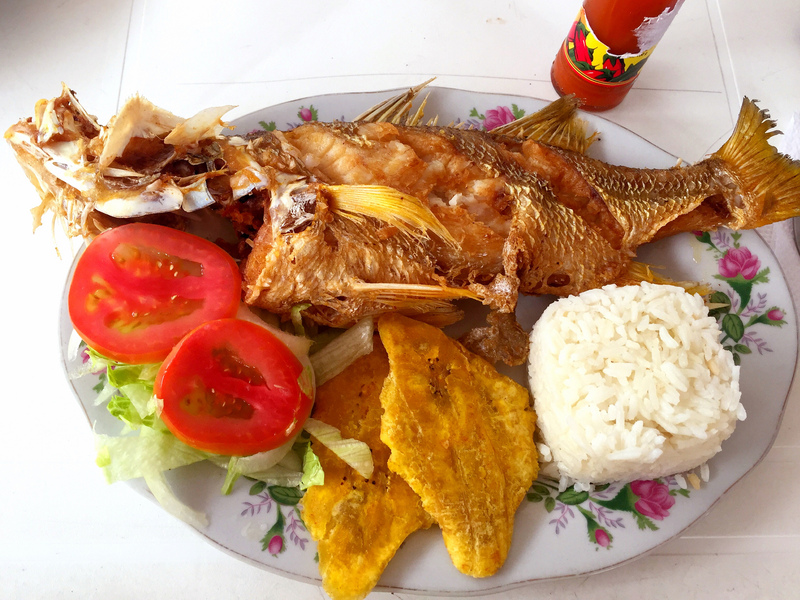 Alongside the coast you can find a diversity of fish (red snapper, corvina, mojarra, tilapia) usually accompanied by a side of coconut rice. If you prefer seafood, then don’t miss out on Cazuela de Marisco. Shrimp, clam and swordfish cooked in coconut milk make up the perfect combination for this creamy stew. All you need is some fresh veggies and a glass of white wine on the side. Caribbean cocktails and aguardiente are Colombia’s clichés. If you want to keep up with the latest trends, you should definitely look out for local craft beers and breweries popping up in every major town. 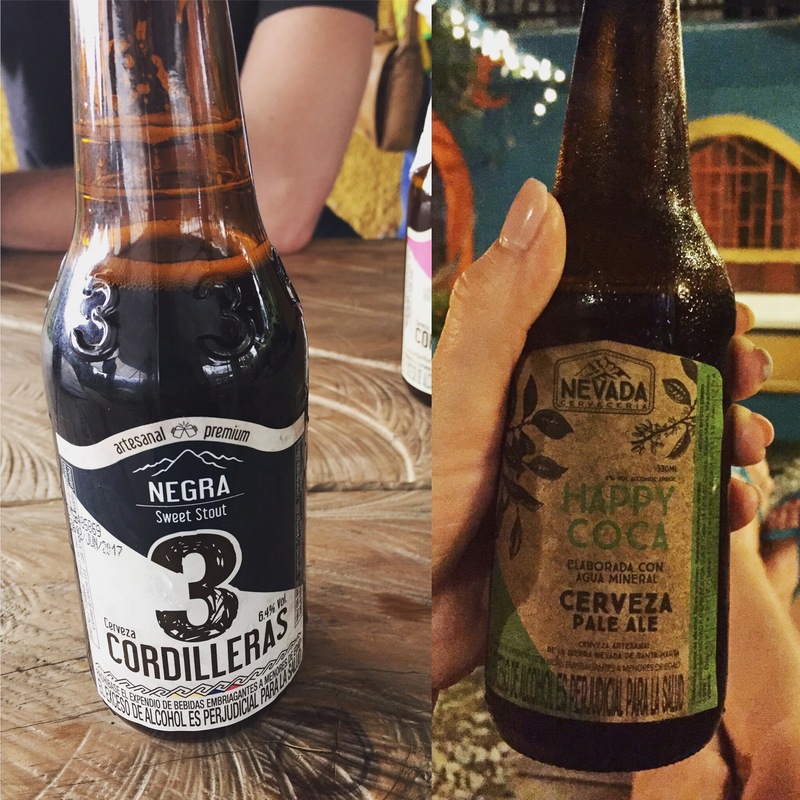 I’ll name just a few brands that won’t disappoint – BBC (Bogota Beer Company), 3 Cordilleras and Nevada Brewery. The last one has even brought out a limited edition brew infused with coca leaves. No, that won’t get you in trouble. Drinking coca tea is legal in Colombia as well as Peru, Argentina, Bolivia, Ecuador and Chile. It is used as a medicine throughout the Andes and it is highly recommended for travellers there as it prevents altitude sickness. It is offered widely in the cafes and restaurants in the capital, so you can give it a try. Coca flour, coca energy bars, coca-infused beer or rum, the leaf is slowly turning into Colombia’s new superfood.